Funding in the region of €12 to €14 million is expected to be soon officially confirmed for the Wee Greenway, linking parts of Northern Ireland and the Republic of Ireland together with safe and attractive routes for cycling and walking. Local groups welcomed the news saying it was an “unbelievable decision” to fund the greenway. IrishCycle.com understands that the funding — which is expected to be confirmed officially by the end of this month — will include two sections of the greenway starting in Derry in Northern Ireland and linking to Buncrana and Muff in the Republic. 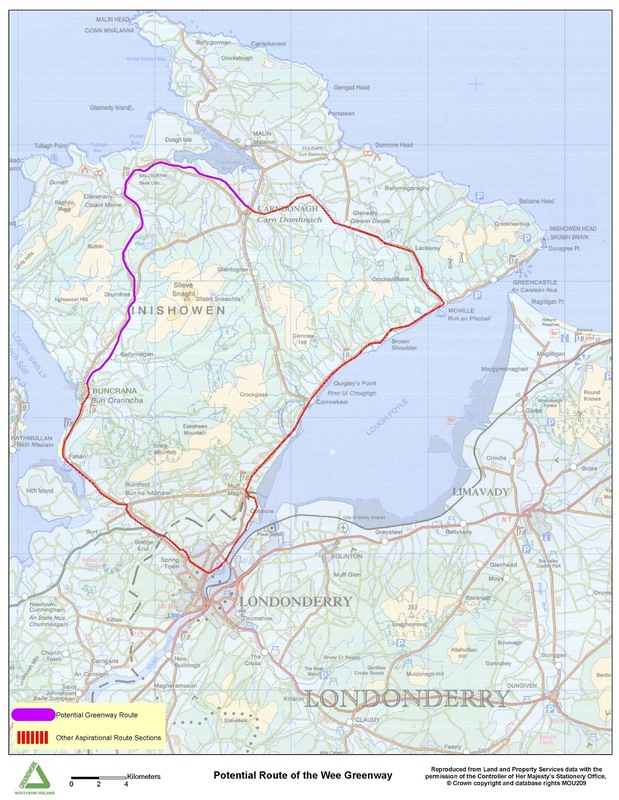 The greenway sections would total just over 30km with an 11km Derry to Muff section and a 21km Derry to Buncrana. A separate cross border greenway is expected to be funded, linking the short distance between Strabane Tyrone and Lifford in Donegal. Local funding will also need to be secured, although it’s understood that the EU funds in question generally contribute a high percentage of funding for projects. He said that the Wee Greenway Initiative has also worked with Donegal County Council to produce a report on the viability of the Wee route between Buncrana and Carndonagh, and they hope that the report will be published on September 28. Fantastic to see people working on the ground get due recognition and support from above. Great news. Looks like it will be a fantastic resource. This kind of focused regional development funding is one of the things that the EU is great at providing, and central government often does not prioritize in favour of high visibility projects. It will be a sad day for UK regions when they leave though they voted overwhelmingly to do so. Might need to leave a little space for the customs huts where it crosses the border….